Are you looking for a complete package that allows you to shoot fast after unboxing the bow pack, then you can choose the KESHES Hunting Recurve Bow – 62’’ takedown bow as your archery mate. It offers a wide variety of drawback weights 15-50 lbs with all essential equipment like Rest, Stringer Tool, and Sight. KESHES Outdoor is a small family own business, and they believe that the traditional and outdoor sports are like the food of our body and soul and that being in nature helps people immensely with their physical, mental, and emotional well-being. KESHES recurve bows bargains a 100% satisfaction guarantee with an extended warranty in the USA. It also supplies full assembly instructions with it to ease your setup process. Please read our details KESHES takedown recurve bow review below to know more about this fantastic traditional hunting bows for sale. The riser of the best hunting recurve bow KESHES made with different kinds of quality wood lamination which helps to improve strength and stability. The beautiful looking multi-layer riser crafted with impressive rounded edges which ensure maximum comfort. The finished wooden handle will introduce you to the best experience while aiming at the target during hunting or bow fishing or target shooting competitions. KESHES 62’’ come up with both left and right-hand orientation. Right-handed bow: pull string with a right hand and Left-handed bow: pull string with the left hand. The riser also comes with a knob which helps you to attach the limbs without taken any help of any tools. Like riser, limbs are a vital part of any takedown bow too. So, KESHES put their highest emphasis during build the limbs of traditional recurve hunting bows. Yes, they use the most excellent quality wood outside layered with black color fiberglass to manufacture the wings of this bow. The limbs are looks not only lucrative but also flexible and sturdy enough to withstand against any archery related rough uses. Limbs are easy to set up and tear off thanks of tool-free bolts, reinforced tips, all the features resemble it as like other high-end bows but spending a bit lower than those. It commences with a wide range of drawback weights which found very rear in other bows available in the market. One size fits not for all, so KESHES started with 15 pounds up to 50 pounds. If you are a beginner, expert archer wants a bow for shooting practice, recreation, bow fishing or hunting game, no issue, the KESHES 62’’ will serve your every purpose. It also a perfect bow designed kept in mind all ages and genders too. If you want a bow that is versatile and easy to upgradable, then you choose this bow as it will help to save your money as you move from one size to another without changing the whole. KESHES presents ergonomically designed comfortable handle and rounded edges riser which makes it’s one of the best recurve bow for hunting. Because of the comfy grip, you will be able to pull hard on the drawback and get maximum force behind the tug, which leads you to shoot accurately with faster arrow speed. As a great hunting bow, you can enjoy your trip to the woods by taking down a big deer or elk. As it comes with pre-installed brass bushing, you can also catch fish with this fantastic bow. However, those who love to use this beautiful bow to attended in archery competitions, this bow will not deprive them too. Moreover, it is easy to carry and store when not in use. Like a high-end bow KESHES, 62 takedown bow also comes with a pre-installed brass bushing to allow all your future up-gradations. You can set Arrow rest, Plunger, shelf pad, Sight, Quiver, Stabilizer, String silencer, and last but not least Bow fishing reel. The package includes the following accessories with it too. A definite step by step assembling instruction for the bow and the sight. Q1: What is the brace height? Ans. : usually the brace height of this bow is 7.75 inches which are extended up to 8.5 inches if you twist the Dacron string. Q2: Is this bow suitable for children? Ans. : As per the manufacturer recommendation, the bow is suitable for all ages and gender persons. Q3: What is the maximum draw length of this bow? Ans. : The maximum draw length of this bow is 29 inches. Q4: Does it supply string in the pack? Ans. : Yes. It includes a Dacron 14 strand string in the package. Q5: Does it compatible for FastFlight? Ans. : The limbs tips of this bow made reinforced, so it will allow using any FastFlight string in it. If you are looking for a bit expensive and high-end bow to satisfy your mind, then you can check out the Southwest Archery Spyder Takedown Recurve Bow. It is not only a posh bow, regarding customer feedback and performance it’s an excellent option for the expert hunters as well as the archery competitors. The features of SAS Spyder are almost similar to KESHES, but it offers a bit wider range of draw weights 20-60 pounds and two different sizes of bow length 62 & 64 inches. Those who are love to pull bigger drawback weights and have no problem to spend a little extra may go for the Spyder. 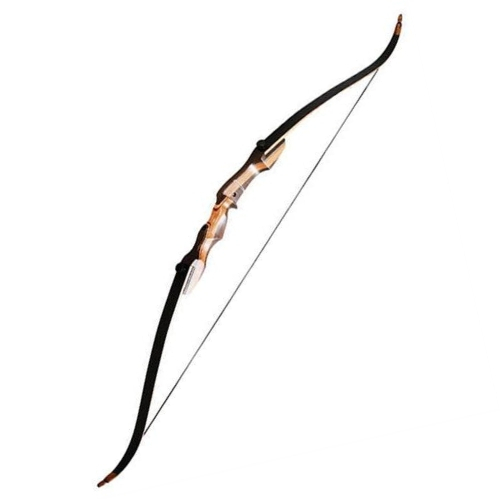 Otherwise, KESHES Hunting Recurve bow is a good option with affordable price. Hope you will enjoy our review on the KESHES Hunting Recurve Bow – 62’’ takedown bow and will be helpful to take your decision to buy this recurve. KESHES outdoor use quality materials to build this bow and accommodate all essential features in it. These improvisations make this bow is the best hunting recurve bow in its class. Top of that money back guarantee, and extended warranty for the USA market will ensure the highest security of your investment. You may choose this bow for you or your family members.